When Rick's group began to rid their new prison home of zombies, they discovered Dexter and three other prisoners who had survived. An admitted murderer, Dexter welcomed the refugees at first, but the welcome quickly wore out. A giant black man in prison? Haven't seen that before! 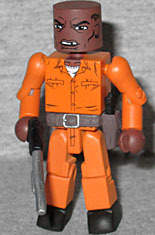 He's wearing an orange jumpsuit with long sleeves, and has a white T-shirt peeking out at the neck. He's armed with a shotgun, and is also wearing a brown gun belt with a removable black pistol in the holster. He's got a very unhappy expression on his face, and they even remembered his earring, his missing tooth, and the tattoo on his temple. Survival tip: loud noises attract zombies, so it is best to travel as quietly as possible. Only kill zombies if necessary, and be sure to use silent zombie-killing techniques. If you have a gun, find a silencer for it. 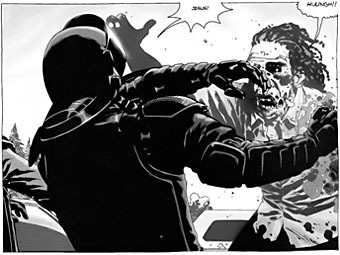 The Dreadlock Zombie is the one that attacked Rick in issue #26. He's wearing a red shirt and dark pants, and just as in the comic, he's missing his entire left arm (though the set includes one, if for some reason you want that). He's missing his right eye, which was never visible in the comic, and most of his teeth are gone. There are wounds painted on his forearm(s), chest and cheeks. 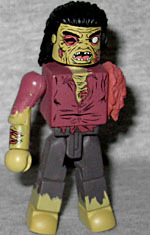 This entry was posted in Art Asylum, MMMR and tagged Minimates, zombies. Bookmark the permalink.